The Cathedral of Santa Maria, more commonly known as La Seu, is Palma´s star turn. 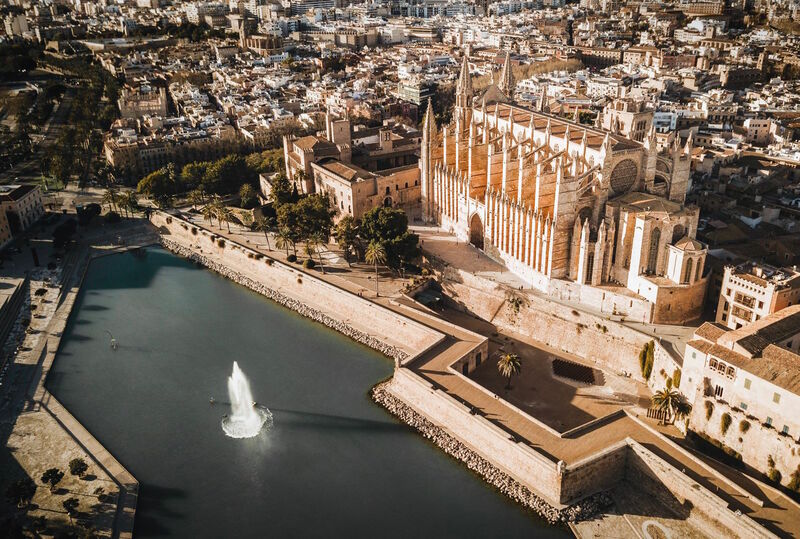 Begun by King James I of Aragon in 1230 in thanksgiving for the conquest of Mallorca and built on the site of a former mosque, Palma Cathedral is the second largest of all Gothic cathedrals in the world. Taking almost four centuries ( opening in 1601) to complete, it has become one of the most architecturally renowned buildings in Europe as it encompasses almost all artistic styles since the Middle Ages. Visible for miles from the sea or land, its scale is breathtaking. The most spectacular of it´s three facades is the southern that looks out on to the Bay of Palma where you can clearly appreciate the Gothic style with decorative features such as the gargoyles, railings and spires. 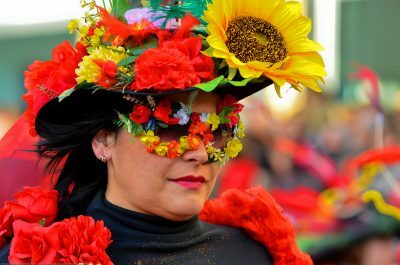 But is it the Rose Window that is the true miracle and draws in the crowds. It is the largest window of Gothic design (known as the Gothic Eye) anywhere in the world at 14 metres in diameter and holding 1236 pieces of glass. 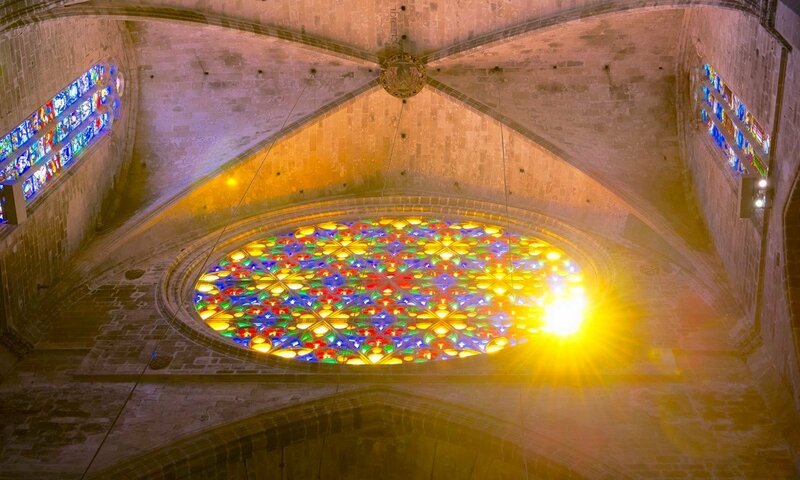 On just two days a year, if the sun shines between 08:00am and 09:00am, the positioning of the Rose window allows morning sunlight to pass through the giant eastern window and create a reflection below its smaller western counterpart forming a forming a colourful figure, of ‘8’. This amazing phenomenon is no trick of light of course but the result of a mathematical genius hundreds of years ago. The first opportunity to see this each year is Candlemas – February 2nd – The second one is on the 11th of November. 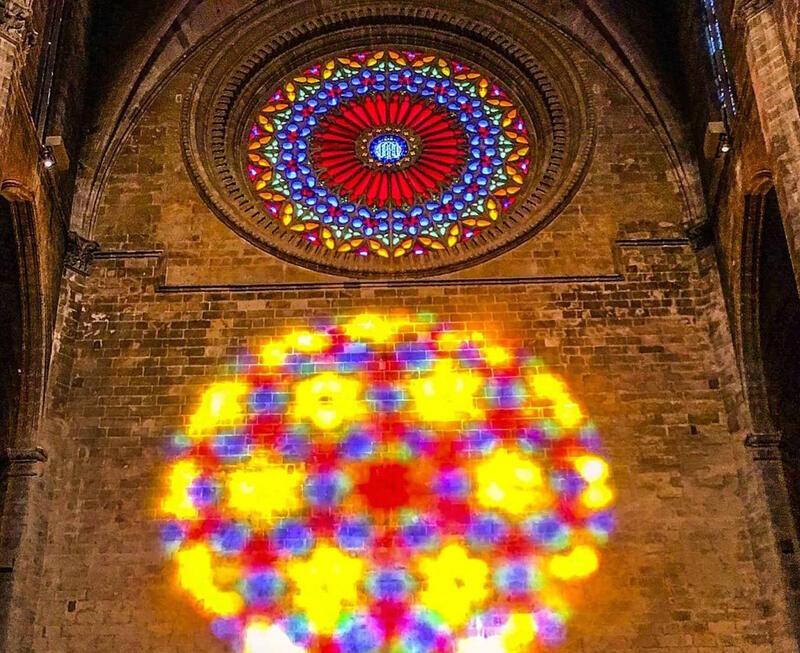 It well deserves its reputation as the `Cathedral of Light ´and must be top of every visitor´s `to see`´ list in Palma. So if you don’t mind an early morning then set the alarm and make sure you are there in time to see this amazing light show! Images kindly provided by Steve .